After all that talk of switching up my schedule I ended up doing my usual Tuesday and Wednesday routes. I guess I’m a creature of habit. 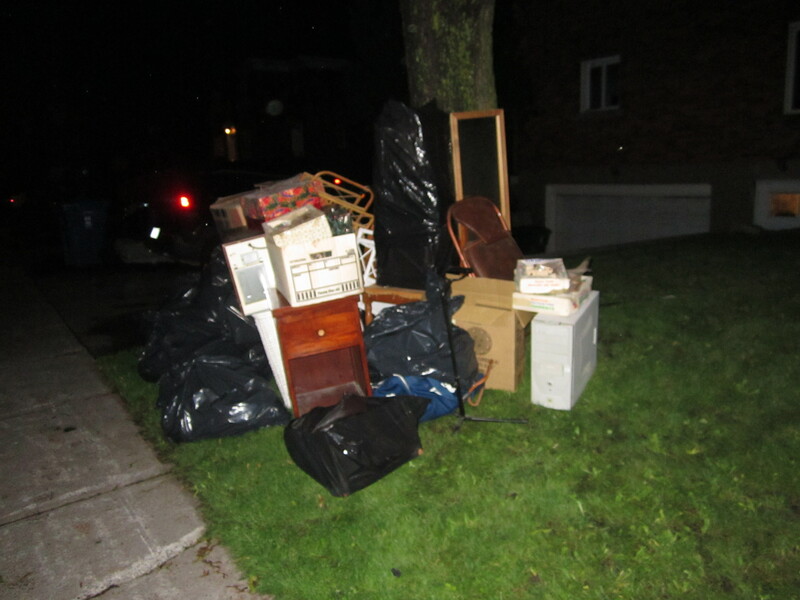 I returned to the spot in NDG that produced the trampoline patch from a few posts back and found some cool stuff. Maybe it’s good that I stuck with the old tried and true. 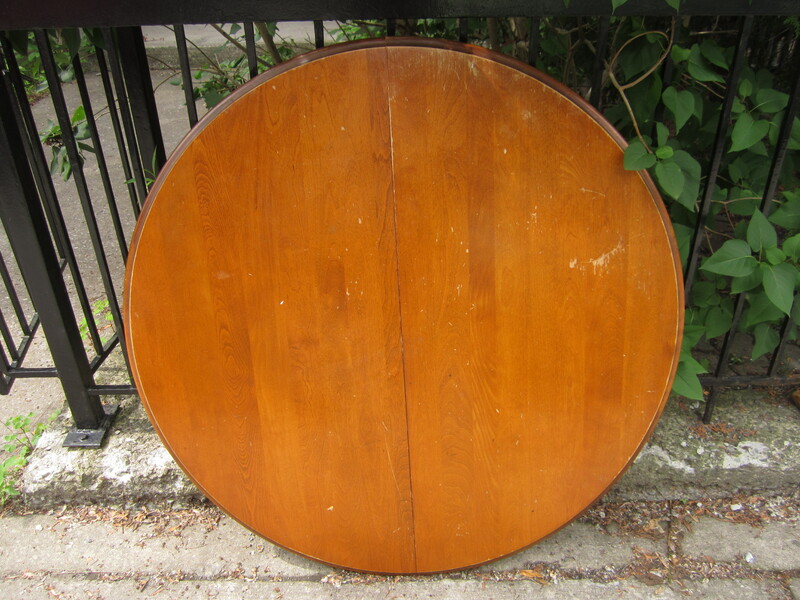 There was some nice furniture on the curb but I wasn’t able to fit any of it in the car. 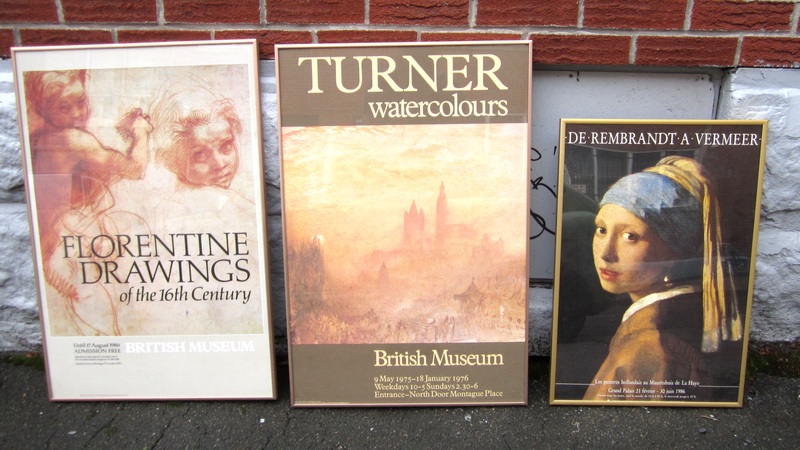 … while a few framed museum posters waited for me at the other end. I found several other posters in the recycling bin. 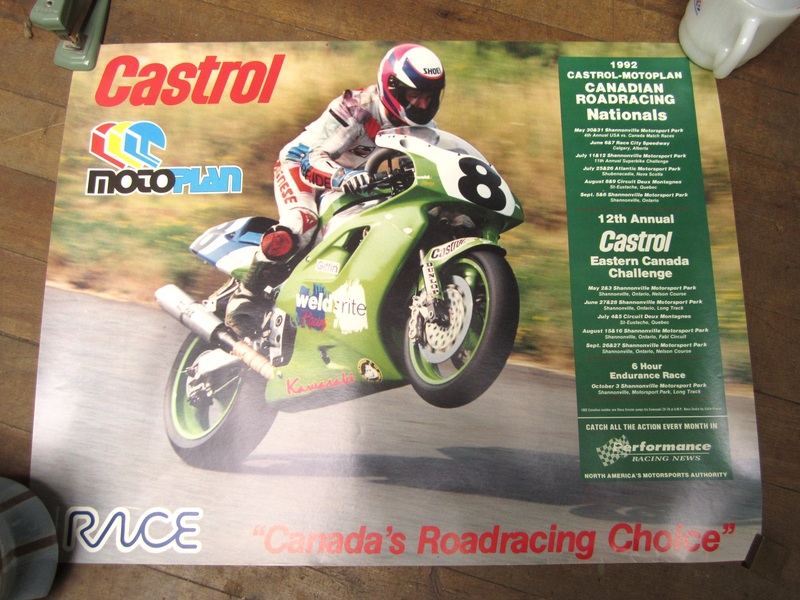 A few were from various Motocross events of the early 90s. 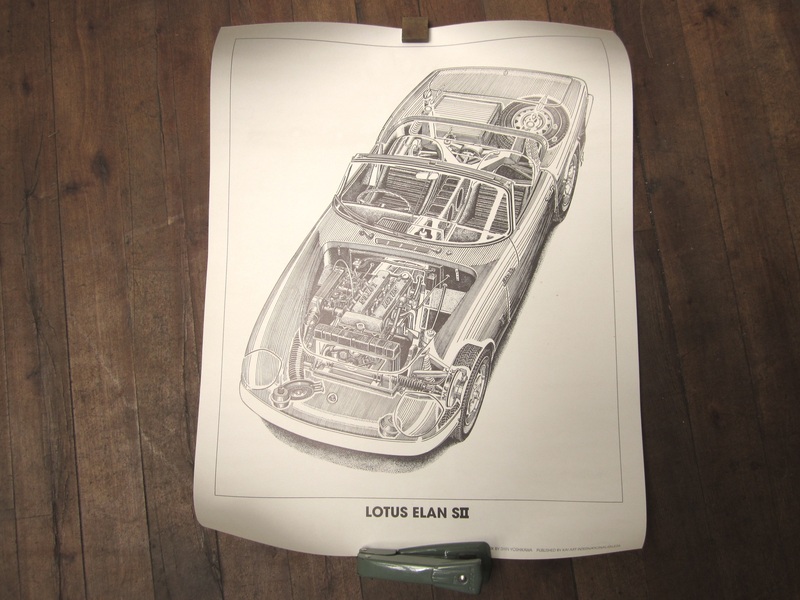 This poster, which features a Lotus Elan SII might be worth a bit of money. It’s like new, and other posters by the artist (Shin Yoshikawa) seem to consistently sell for around 30$ on eBay. 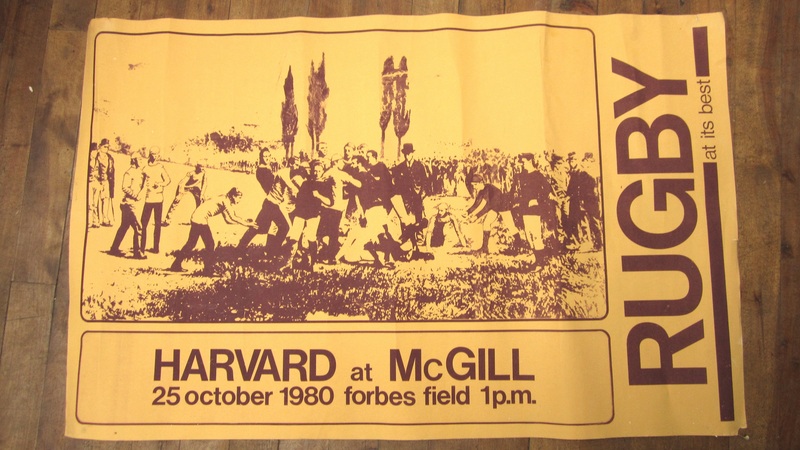 My favourite poster is this one from a 1980 Harvard vs McGill rugby game. Apparently these teams play every year, which is something I hadn’t heard of previously. This poster is a great example of ephemera and I doubt there are too many others left. For the record, Harvard won this game 27-9. 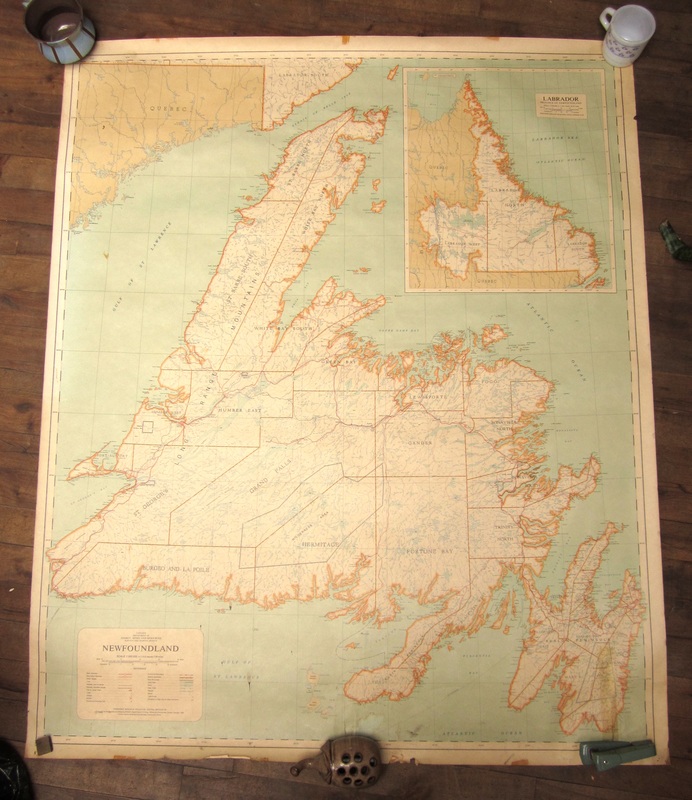 Also inside the bin was a large map of Newfoundland, which was published by the Canadian Department of Energy, Mines, and Resources. 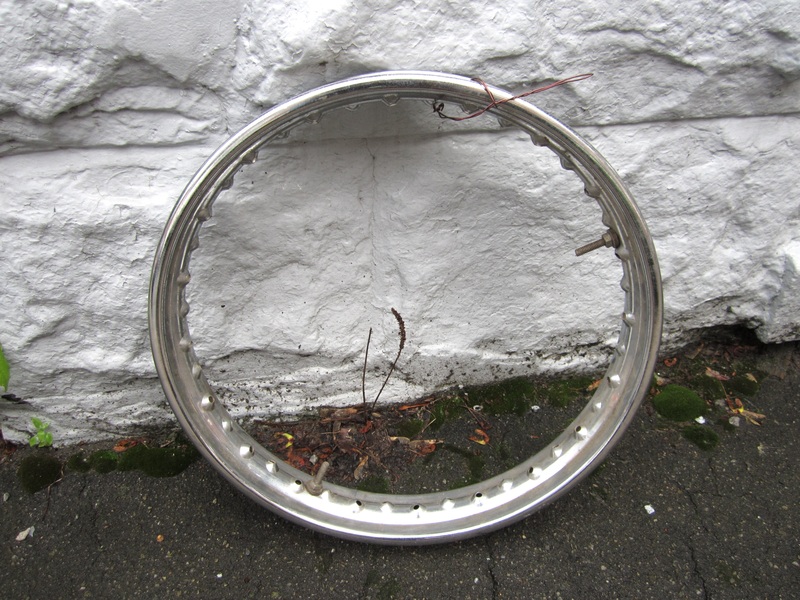 Otherwise, I saved an odd looking wheel that looked to have been hung from a wall. Any ideas as to what it might have belonged to? 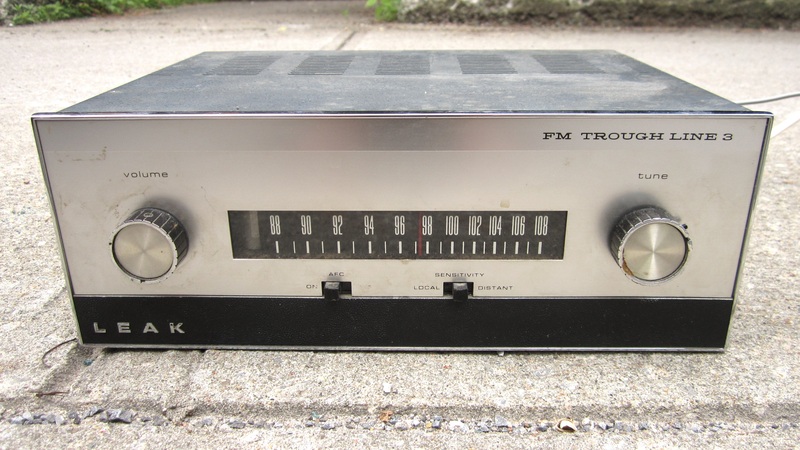 However, it was this old Leak Trough-Line 3 tuner was likely my most valuable find. 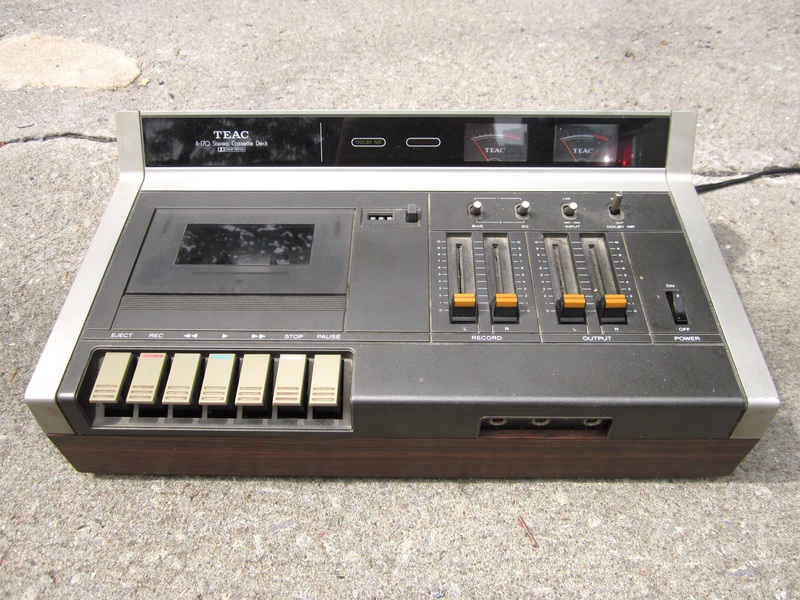 The Trough-Line was a milestone in tuner design, at least according to a post on a audio enthusiast forum. I can’t claim to understand why it was a milestone in design, so if anyone else can let us know in the comments! It’s hard to find any others like it for sale online, though one that was being sold as a restoration project went for nearly 100$ . These people seem to be tossing some interesting stuff. I’ll be sure to keep an eye on the situation going forward. I went to Mount Royal last night. 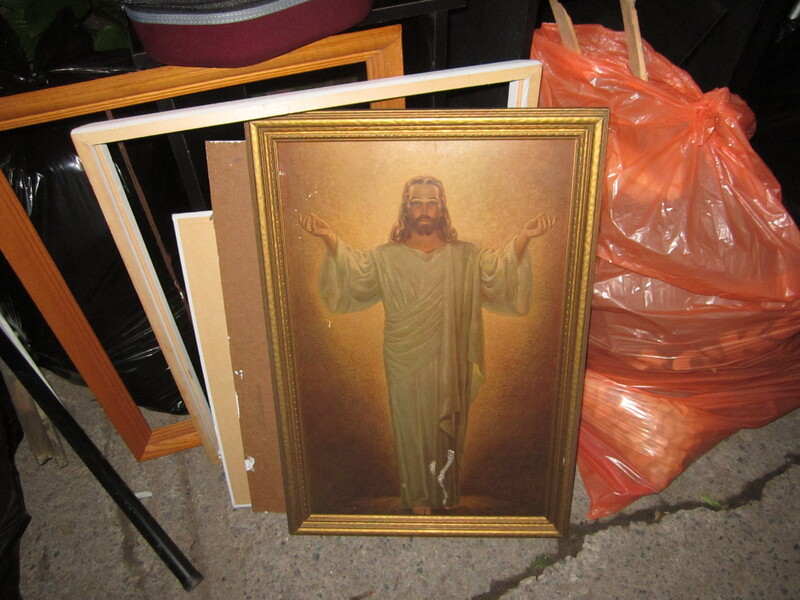 I came across some good stuff in front of a house for rent. 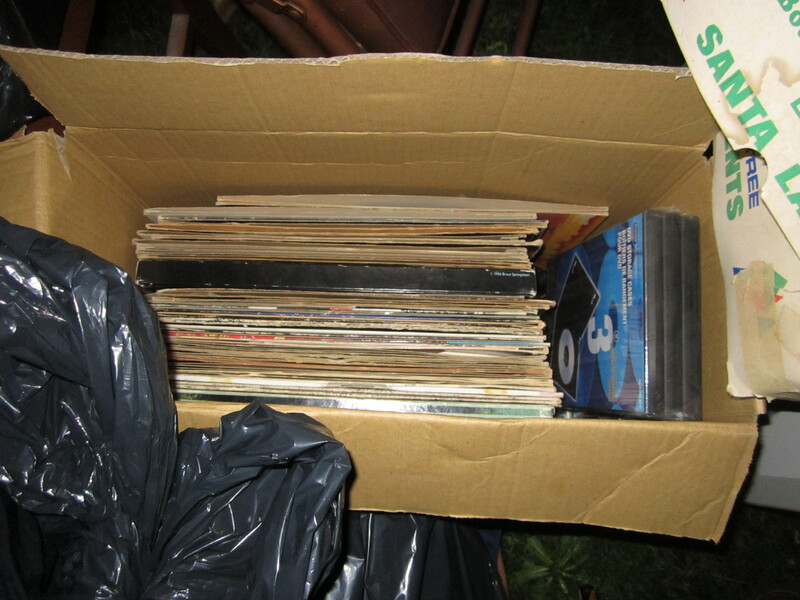 One box was full of records. 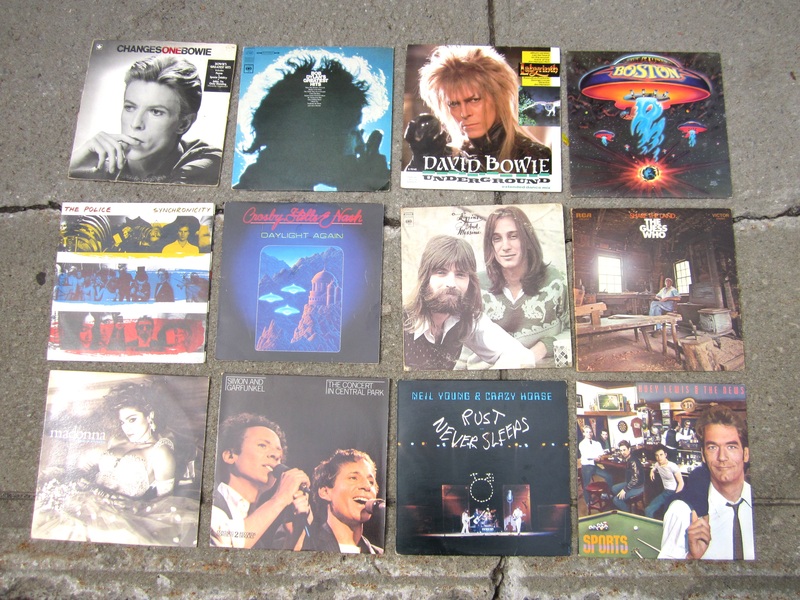 That’s always a welcome sight – records sell pretty well at yard sales! Here’s a selection of my favourites. Most of them are classic rock, which suits me just fine as I have a soft spot for the genre. Artists include David Bowie, Neil Young, Simon and Garfunkel, Madonna, Huey Lewis & the News, and Bob Dylan, just to name a few. The one I was most excited to see though was Boston’s first album (top right), which for whatever reason is one of my favourite albums of all time. I think I’m going to back into record collecting after I move, so many of these will probably end up in my collection. 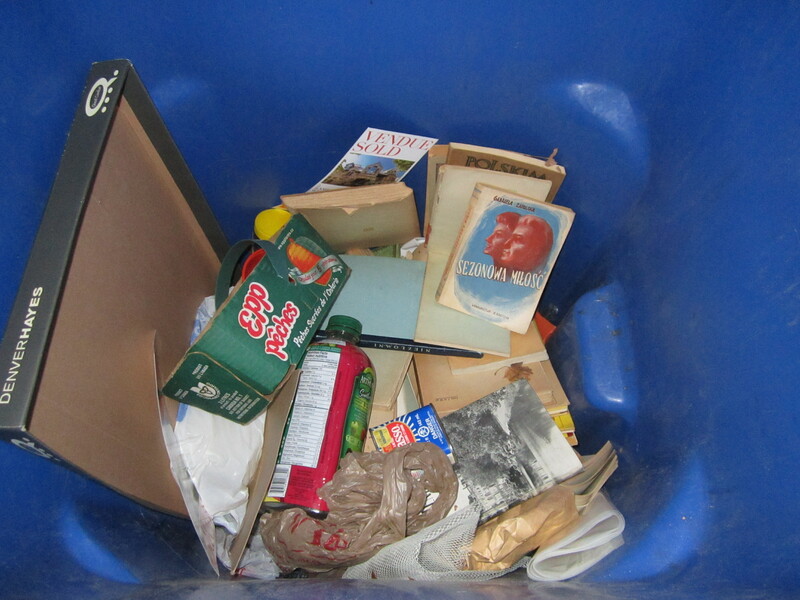 One black trash bag was filled with books. I took a selection of the ones I thought were most likely to sell. I came across this spot later on in my run. I took home the rug you can see rolled up in the middle of the pile. It’s a bit worn but still looks great! I think it’ll look nice in my future room. I didn’t take exact measurements, but I think it’s around 6 x 3.5′. I find big recycling bins really annoying to sort through. 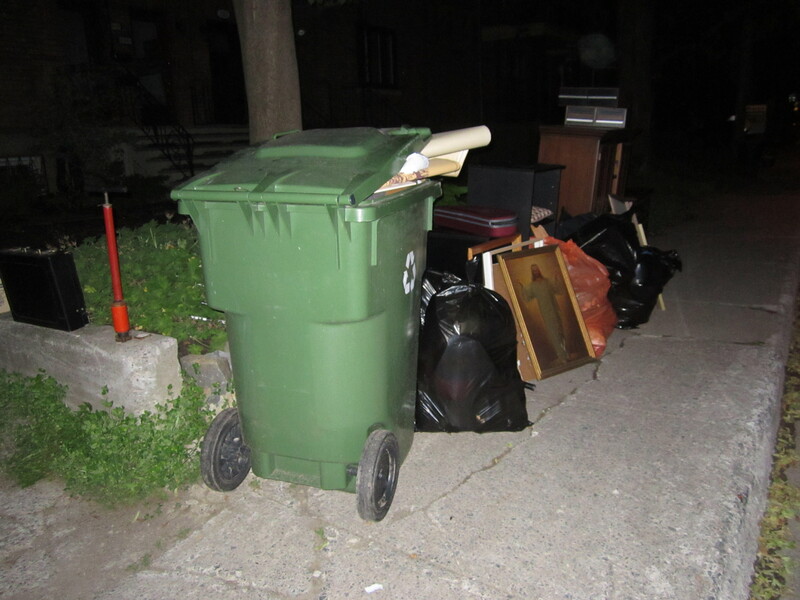 Unlike trash bins, which people usually fill up with garbage bags (which can then be looked through individually), recycling bins are usually stacked with random junk. If you want to see what’s at the bottom you have to sift through a lot of crap to get there. It’s not usually worth the effort. I have a technique though where I sift things up from one corner to at least see if there’s anything interesting closer to the bottom. 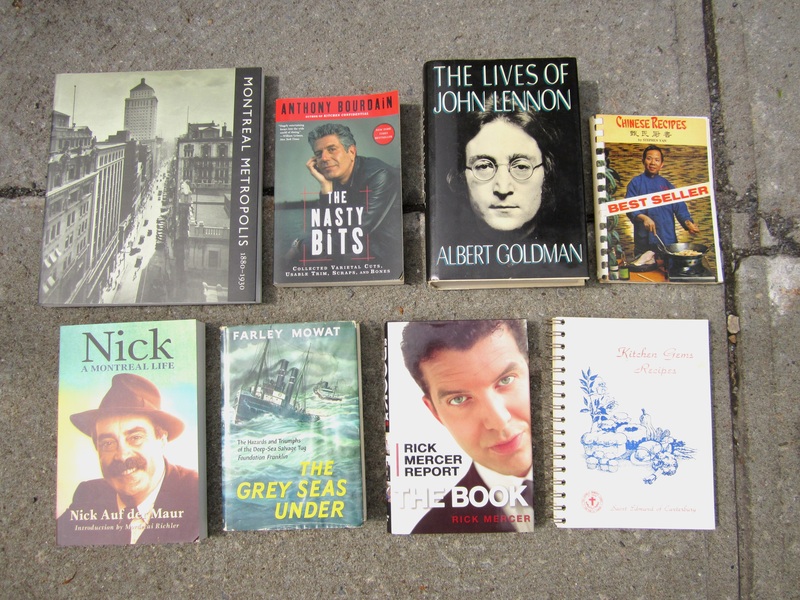 I did this here and saw that underneath the broken-up boxes and other refuse were some old books. After seeing the books I took the boring recycling from the top and put it in the neighbour’s bin, which make it easier for me to get to the bottom. I snapped this photo after moving a good amount of rubbish. I took a selection (over half in this case) of what I found. 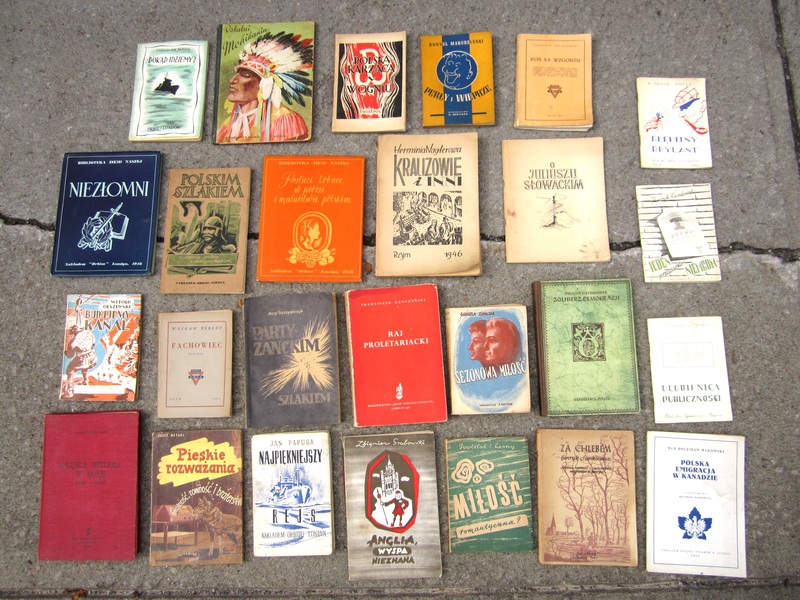 They’re all old Polish books, most of which were published in London and dated between 1945 and 1952. I don’t understand what most of these books are about and I doubt they’re worth much, but I like the cover art a lot. I’ve been finding a bit more Polish stuff recently. I found a similar bunch of old books and newspapers back in early May. Once in a while I can understand a little bit of Polish. 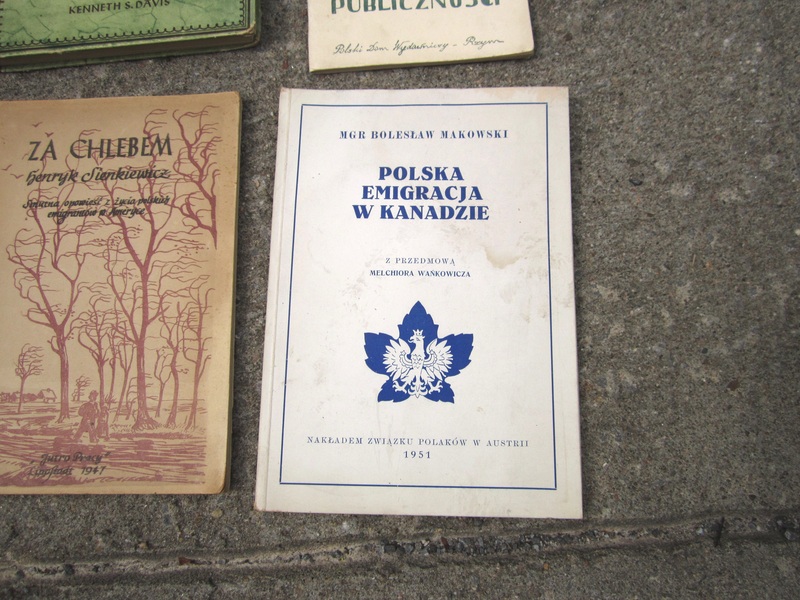 I was able to ascertain that this book was about Polish emigration to Canada. It was published in 1951. My favourites are the Polish translations of English books, perhaps because I can at least figure out what they’re about. 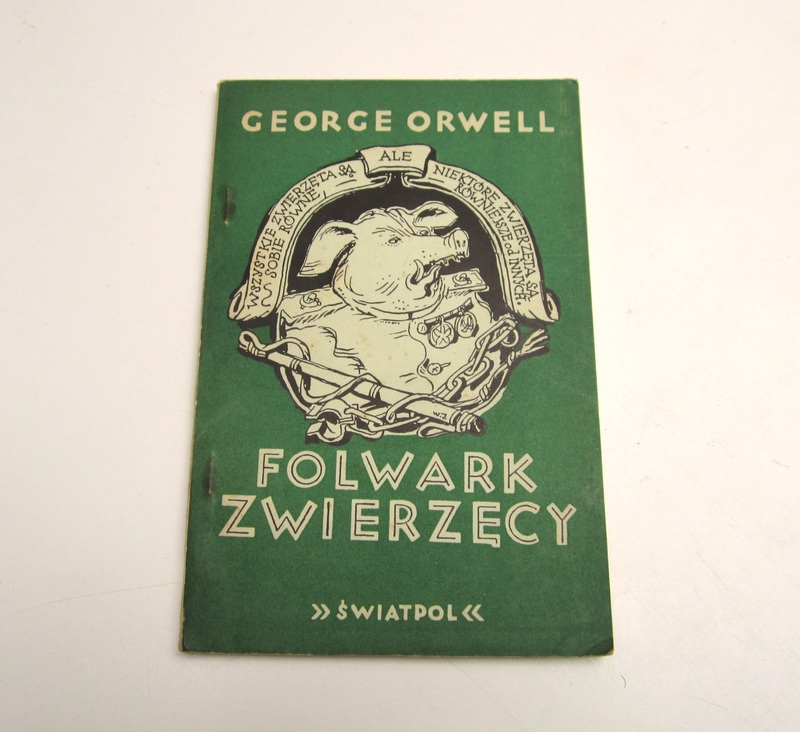 This is a Polish copy of Animal Farm, published in London in 1947 by the League of Poles Abroad. I like how the cover is unlike any other edition of Animal Farm. It doesn’t seem to be a common edition – it was challenging enough just to find another copy mentioned on the internet. I did find one that was listed on some Museum’s website. This specific book was the first Polish edition, according to a Google translation of the passage there. I think that might give it a bit of value. I plan on going out early tomorrow to check out Cote St-Luc and some other places along the way. Hopefully I come back with something good! 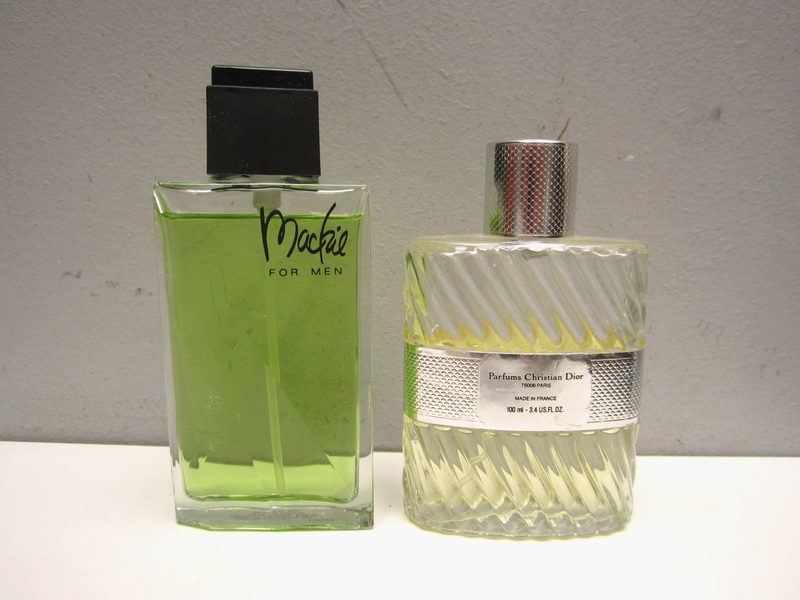 Wow, killer finds. Love the Rugby poster and the abstract art. Would love to see the Rugby poster make it’s way to an exhibit. Does the athletic department at McGill have a museum or trophy case? I’ll likely give that poster to a local archivist, he’ll make sure it’s well preserved. 2$ if you can come to my next yard sale (probably this Saturday). I’d set it aside but I’m a bit disorganized right now and just want to focus on the impending move. Love following your blog. The abstract artwork is beautiful. What are the measurements? Not exactly sure, but I’d guess around 1 metre both ways. Nice framed art posters. You’ll have no trouble selling them. Nice bunch of records! Great books! You’d probably enjoy the “Montreal Metropolis” and the Nick Auf der Maur bio yourself. 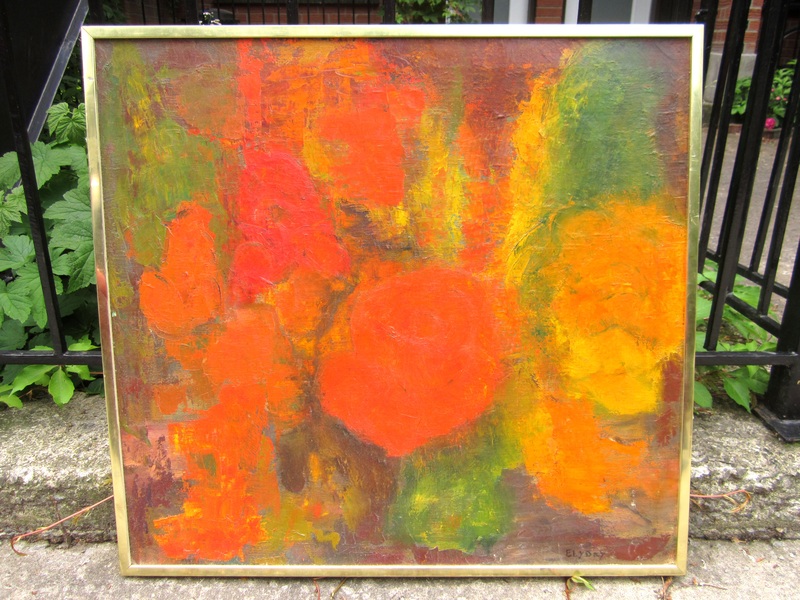 Nice abstract painting but alas, I can’t find any mention of Elyday. That rug will jazz up your room. Nice find. 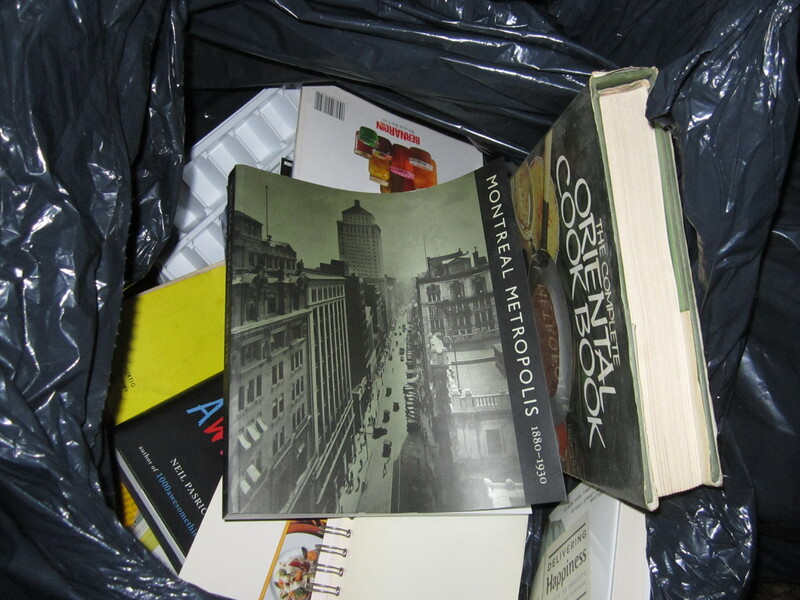 It was a bad decision to throw out books in the black garbage bag.Books should not be thrown out,and if they are thrown out,they should be thrown in the recycling bin.Thank you for rescuing the interesting books.You should have rescued all of them.I live just outside Toronto and when I find discarded books in my neighborhood,I rescue them and keep most of them for myself.I collect books,and have a 900 foot condo which I share with my pet dog and turtle. Interesting abstract piece…I see flowers 🙂 Love the bright colours of the rug. I hope you’ll show us a picture of it in your new place! My understanding was that Leak was higher end. But maybe that was just because it was a small company and thus couldn’t make cheap. There’s a small audio boutique on Bishop, a few stores up from St. Catherine. Maybe they’d be interested, I think that’s the sort of place one bought Leak equipment. The store has been there since the seventies, at least. Radio Lorenz on Park Ave in the block above Bernard might be interested, though in both cases “interested” may not translate to “money”. (Radio Lorenz is a place to get shortwave receivers, and tubes and parts for old tube receivers. There aren’t other stores around like that in Montreal anymore. “Trough line” is a tuning method for higher frequencies, I’m not sure how it applies here. The article isn’t specific, and there is a variable capacitor to tune the tuner. It can’t be a major leap, and doesn’t improve sound, just from the article, makes it more stable, which was an issue in the fifties. It’s one of many paths to the same end, but nobody else went down that path. Thanks for the insight, I wish I knew more about such things. I generally just assume that I can get more for things on eBay than from a store, and I feel weird about bringing something to them and trying to haggle for it. ah,boston’s 1st album,look it up on wiki,i’ll bet you’ll be surprised! but “peace of mind” is definitely one of great all time tunes for those of us who chose Not to live strictly according to the money gods/conformity,it’s a kick it was written by an m.i.t. grad to boot;just goes to show,genius ain’t necessarily out to conquer the world,just itself 😉 pat. True that, Peace of Mind is my favourite song on the album. I enjoy your Blog but also the different comments folk leave too ! Interesting, thanks for the link! I didn’t see any others online. And here is an Ely Day b(two words) http://eronjohnsonantiques.com/products/z-8-0171-ely-day-painting-on-canvas-still-life-of-a-vase-with-flowers The signature looks the same. Interesting, thanks. Seems like Ely Day is not quite famous, but still appreciated. Hi,Martin,you are an inspiration .Not only the poor,but members of the middle class should follow your blog.I come from a middle-class family whose members are spread across Montreal,Ontario,Vancouver,Europe and Australia.We run a sports store franchise and I believe in recycling bottles and cans,scrap wood ,etc that we find in our neighborhood.Some people in the building next to us already moved last week and left behind tennis rackets,good utsensils,unopened cans of food and soup as well at the entrance of the building in open boxes marked FREE.Most of the deliberately left-behind stuff will not be wasted.I live in NDG.I believe more people in every neighborhood should be doing this,not just in the Plateau,Mile End,Rosemont,the student ghetto and Park Ex.NDG has some rich snobs who dispprove of people salvaging stuff from the garbage.The mindset here is not as open as the Plateau,but things are beginning to change here.NDG is a great hunting ground for you with lots of students,lots of middle-class families and individuals as well as some wealthy people.Try to do NDG more regularly. Thanks for the comment. 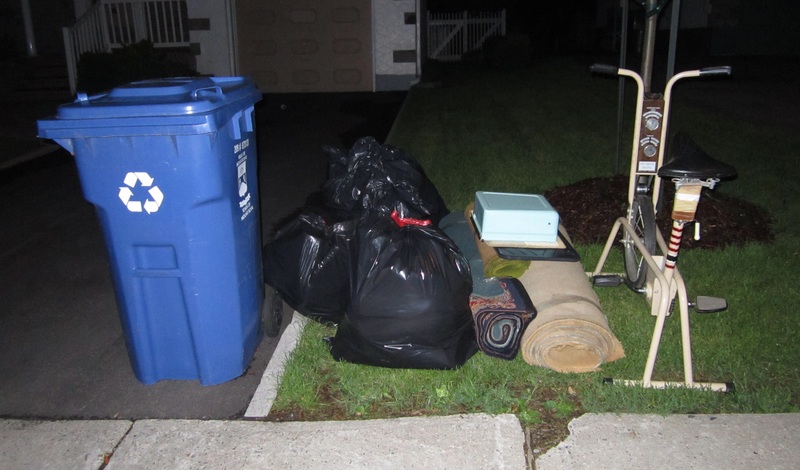 I also like when people leave free stuff in boxes on the curb (most of my items come from black garbage bags, which the vast majority of people don’t open). I cover NDG fairly regularly and have found some great stuff. You should set up an account on discogs online for selling records, I make some serious pocket money from selling vinyl people have thrown away. It can take a lot of time to sort through everything, especially 7″ singles but it’s almost always usually worth it. Wow !!! Once again I’m soo jealous of your Polish books 🙂 !!! If you need to translate dont hesitate :-). Great finds !! !